The Maine Multiple Listing Service (MLS) has included “green” fields for years, ranging from rooftop solar panels to Energy Star appliances, and HVAC systems to programmable thermostats. While only a fraction of Maine homes sold each year currently have significant green features, a strong growth pattern is developing that shows what Mainers are willing to invest in when it comes to a healthier, more efficient and sustainable home. Dropping four figures on a whole house air-source heat pump system or five figures on rooftop solar photovoltaic panels is probably not on most people’s list of must-dos before listing their home for sale—yet. If you’ve recently made energy efficiency and/or renewable energy upgrades to your home, however, and unforeseen circumstances lead to listing your home for sale, you can take comfort in knowing that Maine realtors have you covered. Thanks to the work of Maine Listings, the Multiple Listing Service for the state—and a select number of National Association of Realtors "Green" designees working with them—there’s a green field for just about any improvement you may have made, from low-flow water fixtures to geothermal heating and cooling systems. These fields are constantly being reviewed and expanded. However, for the time being, the green features in the MLS are only visible to realtors. While that may change in the future, you may want to consider a realtor well versed in these technologies—such as one with the Realtor Green certification—for your next real estate purchase or sale. One of the fastest growing features among the houses sold in Maine in recent years is air-source heat pumps, also called mini-splits, which have an outside compressor with copper tubes that circulate among indoor units mounted in the ceiling or high on the walls. Their increased use is due to several factors including their efficiency; improved technology that allows them to work in sub-zero temperatures; their contribution to healthy indoor air quality; and to rebates given by Efficiency Maine, the public utility arm that promotes energy efficiency. Heat pump water heaters are also supported by an Efficiency Maine incentive and are showing exceptional growth, as they work especially well in the unfinished basements so typical of Maine homes. Other features that have doubled (or nearly so) in the last four years in sold housing stock include ENERGY STAR® appliances, insulated foundations, low-e windows, air exchangers, solar photovoltaic and solar thermal systems. The use of propane for heating fuel—which has a 95% efficiency rating—has also doubled in the last four years in houses sold; natural gas, which is also 95% efficient, also continues to grow in usage. While the MLS doesn’t currently include “air sealing” or “well insulated” on the list of green and smart features, a good indicator of these is the presence of an air exchanger in a house—which is on the list. Air exchangers expel stale air and circulate fresh air back into the house. Many capture heat in the outgoing air and use it to pre-heat the incoming air. If you have noted the presence of an air exchanger, you have also likely seen a well-sealed and insulated building that requires it to be there. It will be rewarding to see how usage of new features like backup battery systems for solar panels, energy audits, HERS index scores (like the MPG rating for cars that rates how well a building performs on a scale), smart thermostats and more will continue to grow. Before long, this technology will become standard. And since an increasing number of realtors are being trained to measure the return on investment of energy efficient features and how to explain their benefits and functionality to consumers, they are also better equipped to get the most in resale value when the time comes to sell a high-performing home. what is a green broker? Green-certified brokers earn their designation by completing two days of coursework and maintaining an active membership in the National Association of Realtors’ Green Resource Council. Currently, there are 18 certified Green Brokers in Maine. They are versed in the latest strategies, tools and resources for energy eciency, renewable energy, indoor air quality and more, to help buyers and sellers make informed decisions. Learn more and find a realtor near you at greenresourcecouncil.org. Other Maine realtors may also have gained knowledge of working with green features through past professional experience or courses, such as the “High Performance Buildings: Sustainable and Smart” class oered by The Real Estate Learning Group, which teaches brokers how to list and search with green fields and more. 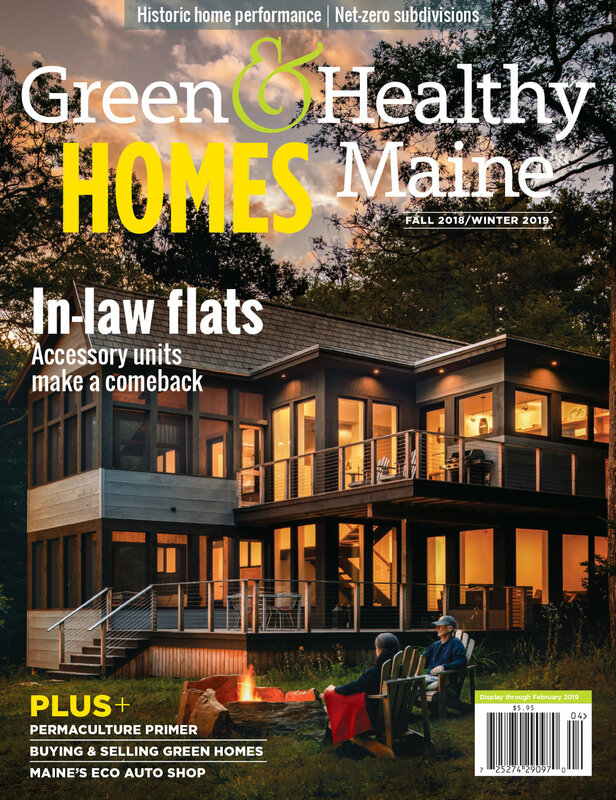 This article was reprinted from the 2018 fall/winter issue of Green & Healthy Maine HOMES. Subscribe today!